days after surgery in May, 2006. In November, DCI.org reported on the declining health of David Welch, a mellophone player with the Garfield Cadets in the mid-1980s. 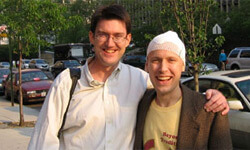 In 2004, at the age of 38, he was diagnosed with a lemon-sized brain tumor. Rather than retreat from the tremendous challenges related to his diagnosis, Welch confronted them aggressively, maintaining a widely featured and acclaimed blog, sharing with the world his struggle to battle the cancer that ultimately took his life. Welch passed away on Wednesday evening just before 6:30 p.m. According to an e-mail from personal friend and former coworker Doug Rutherford: "David's parents and siblings were with him and they indicated that it was a peaceful moment and ultimately a great relief. His mother, Susan Miller, said it made her happy to see him immediately start to look like the David we all know and loved within minutes of passing. She wants to make sure that everyone knows that they are in celebration mode and that David gave us a lot to celebrate with his life." Through the creation of his Web site, 38Lemon.com, Welch educated and inspired countless readers about brain cancer and the medical advancements available for battling this disease. Throughout the ordeal, he worked to reach out to the drum corps community, and those who love drum corps embraced him and helped to elevate his spirits. Drum Corps International salutes the life and selfless contributions of David Welch and extends our thoughts to his family and legion of loyal friends and supporters. Additional information about funeral arrangements will be made available on 38Lemon.com over the coming days. Visit 38lemon.com. Read a DCI.org article from November, 2006 about the courage of David Welch. Learn more about Welch's experiences as a Cadets member in his book "Middle Horn Leader."